Today I wanted to share my experience with cuponation as it helped me save money many a times during my purchases in websites like Flipkart, Jabong, Goodlife and Snapdeal. The best thing about Cuponation is you just create an account with them and they will send you daily coupon updates directly to your email which you can use while completing the order, remember you pay nothing but you will be getting up to 10% to 50% off the total order value depending on the product ordered. This will really be helpful especially for Beauty Bloggers/Writers as they will be able to buy more products. Just to give example of how cuponation works, refer their below link where you will find different coupons/promotion links added for variety of product titles, you choose any of them and it will directly take you to the promotional website which otherwise you will not be aware of or visible when you purchase directly through Flipkart, voila, now select the product and complete the order, it is as simple!!! Cuponation also in FB www.facebook.com CupoNationIndia ,For regular and faster update you can become member of their FaceBook page and get immediate update about their offers!!! The next good thing about Cuponation is their website www.cuponation.in/ is designed so any one who visits the site easily gets what they want and even much more than what they want as they have tie-ups with lot many brands and sites, which means Cuponation can be your starting point of your Online purchase and every time you do you are saving more money for your feature purchases. Refer below image to understand more. 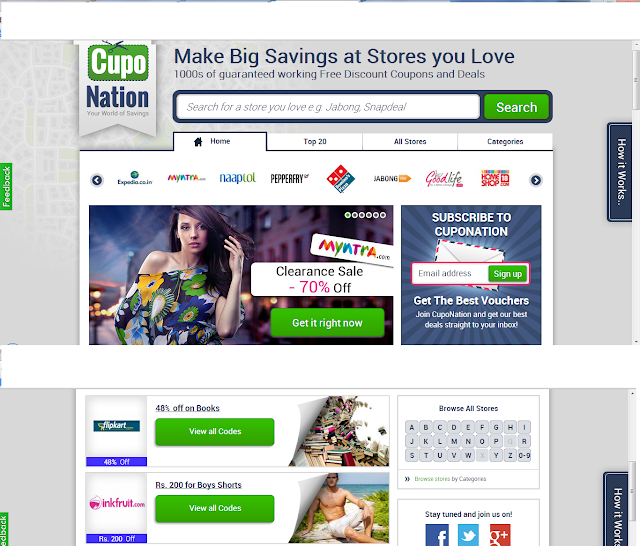 This is just a gist of what Cuponation is, they not only have great deals related to Beauty products, in fact they have coupons for A to Z of product categories / stores, to know more please refer their below link which gives the whole picture of deals they have, it includes very well-known stores. We can't buy our favourite products using these coupons na? thanks for giving useful information about the site..i will surely try this for coming online shoppings..